If you can answer yes to the following questions you want this course. Did you know that there are certain things that you can do to ensure that you are choosing a profitable affiliate program before you start promoting it? That there are simple ways that you can increase your affiliate commissions without spending a fortune on advertising? On the Internet, its all too common to see affiliate marketers waste their time, energy and money promoting products and programs, only to discover that no one wants the product or that the affiliate program doesnt pay out like they thought it would. I hear of it all the time and it leaves many people lost and confused when it comes to promoting affiliate products. Did you know that there are simple things that an affiliate marketer can do to keep all of their hard work from being stolen right out from under them? 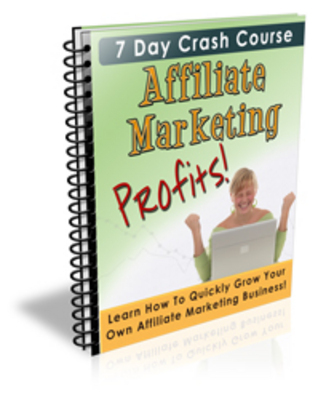 Welcome to the Affiliate Marketing Profits Crash Course. It was created to help solve the ordinary problems that affiliate marketers face and get you, your subscribers and customers promoting affiliate programs that will really make a profit. You can use it to build awareness and to show your readers how to start their own affiliate marketing business fast! You can also use it to educate your members, affiliates and to get more traffic to your own website. This short course is designed with beginners in mind, so even if your readers are just getting started in the affiliate marketing business they will be able to quickly use the information to start promoting profitable affiliate products right away! The course is completely customizable. You will be able to add in your own contact information, product and service recommendations and links to your favorite affiliate programs. Im even including a ready to go to squeeze page confirmation page and sales page, so that you can get set up quickly and easily! with great information that they can actually use! What affiliate marketing is, plus some simple things that they can do to become a wildly successful affiliate marketer. before they join them, so they dont waste their valuable time and money promoting product that wont make money. Some very simple and proven ways that they can promote their chosen programs and boost their affiliate commissions, some times over night! How to avoid some of the common mistakes that many affiliate marketers make without even realizing that they are damaging their business, so they dont have to learn the hard way! Plus some very important things that they must do to protect their hard earned commissions from being stolen right out from under them. Affiliate Marketing Profits Crash Course? Remember, this short course comes with private label, master resale rights so you can edit this and use it for yourself or package it up and sell it and keep all the profits! Heres How To Order To Right Now! It doesnt matter if its 2:00 am you will get instant access to this material. Once your payment is approved, you will be taken to a special download page where you will have instant access to the Affiliate Marketing Profits Crash Course including all of the sales material, webpages and custom graphics package. Affiliate Marketing Profits 7 Day Crash Course complete with private label, master resale rights today and start profiting form it right away! Remember with this course you can add your own name as the author, educate your subscribers or resell it, and keep 100 of the profits for yourself! PS. Dont forget that Ive included the .psd files for all the graphics, so you can change the look and feel of the course to your liking. PSS. And the ready to go squeeze page, confirmation page and sales page, so that you can get set up quickly and easily!